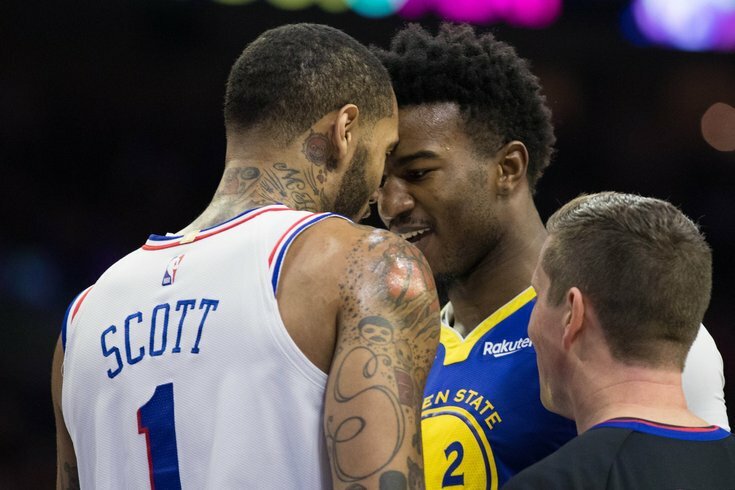 Philadelphia 76ers forward Mike Scott (1) and Golden State Warriors forward Jordan Bell (2) talk in front of referee Nick Buchert (3) during the second quarter at Wells Fargo Center. The Sixers stood toe-to-toe with the Golden State Warriors for most of Saturday night in what would have been an impressive win for a team missing Joel Embiid. But their rampant turnover problem came back to haunt them once again, with Golden State pulling away in the second half for a 120-117 win. There's a lot to take in from that one, so let's get right down to business. Zhaire Smith makes G-League debut; can he crack Sixers' rotation this year? • Ben Simmons has struggled against a handful of the league's elite teams, and that sticks in the minds of a lot of people who follow the team. But we should probably make note of just how good he has been against Golden State this season when discussing his ability to impact the game in a playoff setting. He can thank Draymond Green for some of his early success on Saturday night — his defensive focus is not where it was in previous seasons — but give Simmons credit for attacking at nearly every opportunity. Simmons has gotten better and better at using the threat of a dribble handoff with Redick as a setup for his own drive, and he coasted past Green on fake DHOs on several occasions Saturday. I think it has been taken for granted just how easily Simmons has changed roles and picked up even more minutes with Philly's bigs in a state of disrepair. He's playing entire quarters at a time, shifting from the primary point guard to the guy guarding the biggest (and often best) players on the other team. He took on the challenge of guarding Steph Curry and Kevin Durant alike, and his engagement level on the defensive end was sharp as ever despite the big minute count. He has not been leading the way as a scorer, not that Simmons ever does, but he is building the foundation that allows the rest of his guys to get going. Don't undersell that. • Speaking of Simmons, he and Butler were absolutely flying around on defense against Golden State. It was the two of them at their absolute best, jumping into passing lanes to create turnovers without leaving windows open for Golden State to exploit with their passing. To state the obvious, the Sixers are a much different team when they can get out and run instead of having to constantly execute in halfcourt sets. When your two best perimeter defenders are on point, the game gets easier for everyone else. • It was certainly not the prettiest night for Butler on offense, but I still thought he provided much more good than bad there. I think the thing that has impressed me about his approach with Harris on the team is that when he's not expending energy creating shots, he's transferring that to mix it up on the offensive glass and extend plays in any way possible. Yes, the Sixers need him to be more efficient as a scorer, but he has proven adaptable in this new setup. For a guy who is at this point notorious for making demands and wanting to win "his way," I think he deserves credit for finding different ways to contribute each night. • Tobias Harris has been a revelation in Philadelphia for a lot of reasons, and while his impact on the halfcourt offense has been striking, I think his influence on their transition game has been sneaky important. By putting another guy on the floor who can take a defensive rebound and push the ball, the Sixers have become a lot less predictable when they get a stop or a turnover. When you can unleash either of Simmons or Harris away from the ball in transition, it sends transition defenses into scramble mode having to account for a big athlete rumbling down the floor. That draws attention away from guys like JJ Redick or Jimmy Butler and often creates more open space for whichever guy the Sixers have pushing the tempo to begin with. Harris' ability to carve up mismatches is huge for the Sixers night after night, and it was no different against the Warriors on Saturday. • The Sixers blew a lot of golden opportunities to extend their lead against the Warriors, and it eventually came back to haunt them when Golden State got going in the third quarter. There were misses from all over the floor — a wide open three from Redick, Butler shooting into the bottom of the rim, Harris botching a layup, and Simmons missing badly from three feet away. You might be able to get away with that against teams like, say, the New York Knicks, but the big run from Golden State is always coming. They are the sort of team that has enough talent to coast for quarters and still embarrass you by the time the final buzzer sounds. Golden State demands excellence, and the Sixers took their good start for granted. • For all the nice things I said about Simmons, he was far too careless with the basketball, which ties right back into the above bullet point. Philadelphia's ethos is an admirable one centered on sharing the basketball and playing unselfishly. That doesn't give you an excuse to slack on ball security. Simmons is one of the game's best passers, but at some point, he's going to have to learn there's a time and a place for the home run pass. I love that he's willing and able to fit passes into tiny windows, but when leads start to crumble, the priority has to be making sure they're getting into their sets cleanly. It seems like the Sixers could clean up their turnover problem by just simply cutting down on the overpassing. Now that they have Harris in the mix, they have multiple guys who can score in isolation on the floor at a time, and in theory that should lead to less turnovers. But perhaps because they're all trying to figure things out on the fly, the Sixers continue to cough up the ball on plays where turnovers are completely avoidable. You won't hear me say this too often to players in a team sport, but a little selfishness would go a long way, I think. • Philadelphia's "tournament" to determine which bench wing is going to get a rotation spot in the playoffs has to be one of the saddest tournaments that has ever existed. Every time I'm convinced one guy has proven they shouldn't get the nod over their counterpart, the other one plays a game and shows they don't really deserve the minutes. It was Jonathon Simmons' turn to stink up the joint on Saturday. I think he has actually been reasonably helpful on the defensive end, but offensively he bogs down the team every second he's on the floor. If the ball gets to his hands late in the shot clock, good effing luck. • Should we file a missing person report for JJ Redick? I almost forgot he was on the team on Saturday. When he did make an appearance, he was missing wide open shots, and it's not like he's a strong defensive link in the chain. He is in a pretty bad place right now, and the Sixers need more from him whether Embiid is in the lineup or not. I will always assume a shooter of his caliber will pull out of slumps, but with an even mediocre game, they have a chance to sweep the Warriors for the season. Brutal stuff. • Mike Scott had the game of his life on offense, but no idea why he's taking a foul at Golden State's free-throw line with 35 seconds to play and the Sixers down three. The Sixers made it a one-possession game and could have played it out and had a chance to tie it. Instead, they put Durant on the free-throw line and turned it into a five-point game with the swiftness. If that's a Scott decision, it was a brain cramp. If the coaching staff drove that decision, that's inexcusable. • Another late-game decision I did not like — Ben Simmons not even attempting to make his second free throw with 10 seconds left in the game. I thought it made all the sense in the world to bring in Jonah Bolden to help on a potential rebound opportunity, but throwing it off the backboard felt silly. Try to make it and then go from there. The Sixers didn't have a timeout, but there was more than enough time to play the foul game and still get a final shot. Look, at the end of the day, losing to the Warriors isn't something to get mad about. But the process was not great, and the Sixers spent stretches of the game beating themselves. They deserve the criticsm that will come following that kind of loss. • Mike Scott and Jordan Bell got into a bit of a kerfluffle late in the first half, with Scott giving the younger big man a staredown after wrapping him up on a layup attempt. The two yapped at each other and nothing really came of it, but it was the only real sign of animosity between the two teams in the first half. I loved this, for what it's worth, and I think Scott is exactly the sort of player the Sixers needed off the bench from an attitude perspective. He's not going to back down from anything in a playoff series, whether that's a big shot in crunch time or a tough defensive assignment. He's a tough M.F.er, in other words. Teams can always use those guys in the playoffs. And, of course, the Sixers needed that edge and confidence against Golden State on Saturday. Scott came in for Jonah Bolden early in the second half, who was struggling to find his way on the defensive end. Scott immediately came in and started raining threes on the Warriors, which forced DeMarcus Cousins to defend him out to the three-point line. Without Scott having one of the best games of his life, the Sixers would have folded like a cheap tent. Instead, they hung around and hung around as Durant carved them up on the other end, and it made for a hell of a spectacle. Nothing ugly about that.